"Breathtaking view of Tengger Caldera complex"
Mount Semeru is the part of the sand sea of Caldera, where Mount Bromo is located, the highest mountain and active volcano in Java with 3676 meters above sea level. If you love natural beauty, you must considered to visit this place, especially, if you like to hike, a backpacker, it is the most challenging to climb this mountain. It’s very steep and a dangerous mountain to hike with their Poisson gases. The scenery on the way is magnificent with beautiful high altitude volcano lakes, tropical rain forest, sub-alpine forest, and the view from the top is spectacular, you wouldn’t be disappointed. Semeru lies at the south end of the Tengger Volcanic complex. Known also as Mahameru (Great mountain), it’s very steep and also a dangerous mountain to hike with their Poisson gases. The mountain erupted in 1981 and 1994. And it’s still erupts periodically every 20 minutes. 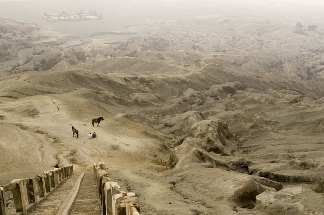 And is one of the few persistently active composite volcanoes on earth. So be careful and be prepared if you’re planning to climb this mountain. To climb Semeru you need at least two days one night to reach the top. Best time to do it is during the dry season. Take a minibus from Malang to Tumpang and from Tumpang to Ranupane with 4 wheel drive vehicle. The route through Probolinggo is more interesting to do. 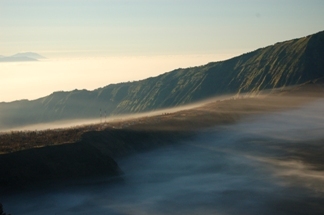 It leads across the sand-sea caldera and passes Mount Bromo.